As architects we are compelled to produce an independent project with each building licence application which show what amount of building materials require recycling. We have to calculate the quantity of each type of building debris and where they should go and the contractor will have to present official tickets from an official landfill at the town hall as proof that the calculated debris has been deposited in the right places. We obviously have a computer programme that does the calculation, we introduce the type of building work and the programme extracts the debris that will emanate from that type of work and even include the lunch leftovers that the builders produce during the construction period. When carrying out this exercise it was interesting to discover which part of debris went where so I decided to write this article and ask you to pass a little test to see if you know how to recycle. We will see it a little later. Recycling is very important and recycling correctly is as important or even more. Reduce consumption, reuse objects, recycle materials, return packaging and repair what can have a second life are the five R's of sustainability. 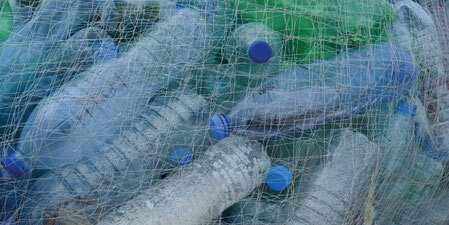 Every year, billions of plastic bottles are thrown away in the world. According to a study by Greenpeace, this means that between 4 and 13 million tons of plastic end up in the oceans every year, a plastic that marine animals devour, with the risk it implies for their lives. In Spain, a total of 1.3 million tons of domestic packaging are recycled annually, according to the 'Study of Recycling Habits of Spaniards', prepared by the Apolda Institute. Recycling well is indispensable to help this whole concept. But sometimes we do not succeed and it is because of our awn ignorance. These are ten common mistakes in the separation of household waste for recycling. Where will you deposit a used Pizza box? One of the most common recycling mistakes is to leave the greasy cardboard of the pizza in the blue container. Don’t!! : you have to take it to the organic matter or the grey container, when the oil or fat is absorbed by the cardboard, makes it difficult for the treatment plants to recover the paper and cardboard. Pizza boxes that have a small amount of fat may be worth it, but if the oily substance has taken over the cardboard, it is best to leave it in the general container, the organic container. However, remember that the boxes have two sides: one of them may be unusable, but maybe the lid can be recovered for recycling in the blue cube, the cardboard one. As incredibly as it may seem, there is still a lot of ignorance about what is a metal package and what is not (and it must go to the yellow container). Many citizens do not remember that brick packages and cans are containers and therefore, they must be deposited in the yellow container. The brick packages are perfectly recyclable and can be given a second life. And, cans are made of aluminium and can be recycled an unlimited number of times. What about the plastic bag? If the recycling container is far from your home, or at a walk distance, it is normal to put the rubbish in a bag, to help transport it. But watch out, you have to remember to empty the waste in its proper container and recover the plastic bag. The plastic bags that end up in the paper or glass container are one of the most recurrent nightmares of the workers who work in the waste treatment plants. The reason is that they get stuck in the machinery and make the whole process difficult. Although they are made of plastic, toys do not go into the yellow container. The reason is not a question of fancy: toys are not packaging. Some of them, in addition, contain other materials, such as electrical components. So, what should we do with them? Plastic toys must be brought to a “clean point” (special collection places) of your city, since they are usually made of good quality plastic. This makes them more valuable, as it is possible to melt them and use them again to manufacture another object. In addition, there are different NGOs that collect toys used for social projects. Every town hall normally has a list of clean points and their opening hours displayed in the web pages. What about a baby milk bottle or kitchen utensils? Like toys, and although they are also made of plastic, bottles and pacifiers should not be put in the yellow container either. The convenient thing is to send them to a clean point. And the same happens with kitchen utensils that with the passage of time and use cease to be useful, such as a spatula or pans. Remember: they do not go into the yellow container. Where do I throw my toothbrush? Neither the toothbrushes nor razors have to be deposited in the yellow container. Although their main material is plastic, they are not packaging, and their correct destination is the in the grey container. In the best case, the recyclable materials will be extracted before being sent to the incinerator or to a deposit. What do I do with cotton swabs? Other things that should go into the grey container, although many end up in the yellow, are the swabs and the wet wipes. No, they do not go into the green container, destined for glass. The traditional filament bulbs must be deposited in the grey container. But if they are LED or fluorescent bulbs it is better to take them to a clean point or to the stores where they sell them, since, usually, they have a container for them. These type of rubbish are treated by separating the glass and metals materials which are valuable materials. In addition, during the process the mercury is extracted from the light bulbs, which serves to make batteries or light bulbs. Natural cork is an organic material, which is part of the bark of some trees (cork oak). Therefore, if your city has an organic waste collection system, that is the most appropriate place to dispose of the cork from the wine bottles, as it can become compost. And if not, although it seems incredible, you have to leave it in the yellow container, because it is considered a packaging. Other objects that also go into the yellow container are metal plates and plastic plugs. 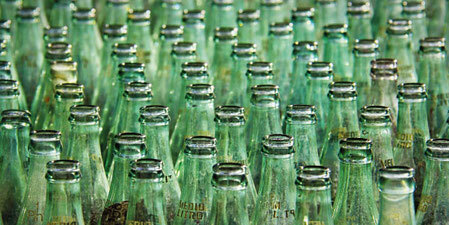 Neither the glass (glass vessels) nor glass panels are glass packaging, so they should not go to the green container. The reason is that glasses and cups contain materials that differentiate them from the strict glass, and need a different treatment and higher temperatures to melt them. You have to take them to the grey!! container or to a clean point. How many have you got right?